97-year-old Charles Eugster of Zurich practices what he preaches. ISPM’s 2017 Christmas seminar keynote speaker won two gold medals in March at the World Masters Athletics Championships Indoor in Daegu, South Korea. 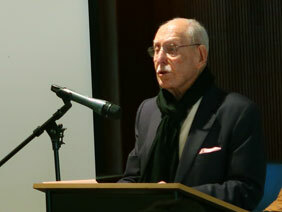 “Aging could be so different”, Eugster told the audience assembled on December 8, 2016, in Bern. His talk (delivered standing up over the course of an hour) addressed issues ranging from the proper way to build muscle mass (it’s important to give your muscles a chance to recover) to the benefits of dietary supplements (he takes several) to the reason he took up body building at age 87 (“I wanted to look good for the ladies”). Eugster’s key message for the researchers in attendance: more research is needed on the body and aging! In South Korea the retired dentist won the 60-metre dash with a time of 15.42 seconds and the long jump with a distance of 1.25 metres in the age class 95 to 99.